What's the difference between USB 1 and USB 2? There is a new USB 3 standard, with specifications expected to be released in the first half of 2008. USB 3 is expected to have a bandwidth 10 times greater than USB 2 or about 4.8 gigabits per second, will use a combination of copper wire and fiber optics which should allow for future expansion, and should be backward compatible with most USB 1 and 2 devices with limitations. We should begin seeing USB 3 devices in late 2009 or 2010. USB 1 or 2, how can I tell which one my computer has? If you have Windows XP, the easiest way is to use the device manager. There are several ways to get to the device manager. I will use my preferred method here. Locate a "My Computer" icon (or a shortcut in the start menu) and RIGHT click on it. Chose Manage. Select the Device Manager on the left. Scroll down the right side until you find the Universal Serial Bus controllers section. Click the + just to the left to expand the list. Look for one or more lines containing the words, PCI to USB Host Controller. If any of these lines contains the word "Enhanced", you have at least some USB 2 ports. 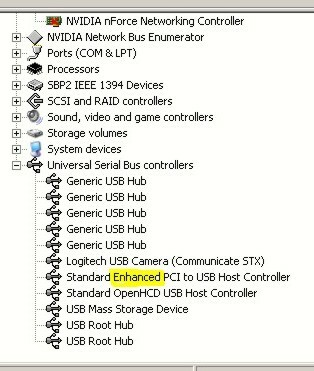 If the word Enhanced is not present, you only have USB 1 ports. If you have a USB 1 hub plugged into a USB 2 port, any devices plugged into that hub will run at the USB 1 level. Important: Both USB 1 and USB 2 devices will work through either type port, but USB 2 devices will not work as fast if plugged into a USB 1 port and some features of the device may not be available. How far can I run my USB cable from the computer? USB specification says 5 meters (16 feet); however, I have been able to extended some cameras 40 feet with a powered USB hub placed on the end of the camera cable, and USB extension cords. Some cameras won't work that far away. You could also use a USB amplified extension cord, but I find those are more expensive than a hub so not worth the trouble unless you have some special situation where a hub won't fit. There are some products which claim to enable you to extend USB devices up to 300 feet, but I have no experience with those. Helpful hint: Plug the hub into the computer first, and wait for the computer to recognize and configure the hub before plugging in the camera.